Analysts at Bank of America Merrill Lynch, who spoke about this phenomenon in their latest report on capital flows, have a name for it: schizophrenic flows. That’s because inflows into government bonds indicate that investors are in a “risk off” mood, whereas in the equities space, inflows in the three categories mentioned above are, in the analysts’ view, signalling a “risk on” mood for stocks. However, there is another way to look at this: flows are not schizophrenic at all; in fact, they are perfectly normal. So far this year, technology was the top sector in equity investors’ preferences. Despite the Facebook data drama, technology still managed to attract around 9% of assets under management (AUM) in the period. The next preferred area was Japan, with 8%, according to EPFR Global and Bank of America Merrill Lynch data. Third ranked was the world’s risk-free asset of choice, US Treasury bonds, with almost 6% of assets under management. Treasuries were followed by emerging markets with around 5% of AUM and by financials, with more than 4%. If we look at the least favoured asset classes, high yield bonds are number one, followed by the utilities and telecommunications sectors. What this tells us is not that investors cannot make up their minds. It tells us that Treasuries’ role as a safe haven is still solid, but that investors are picking up other assets to diversify away from them. With the Federal Reserve poised to raise interest rates further (although President Donald Trump is putting pressure on it to stop), Treasuries are no longer as attractive as they once were. Add to this the fact that the Bank of Japan is still buying assets and that central banks in emerging markets are in no hurry to hike interest rates, and it begins to become clear that investors are picking these two regions as some sort of safe havens, at least temporarily. On the other hand, an old friend suggests investors have not completely lost their risk appetite. 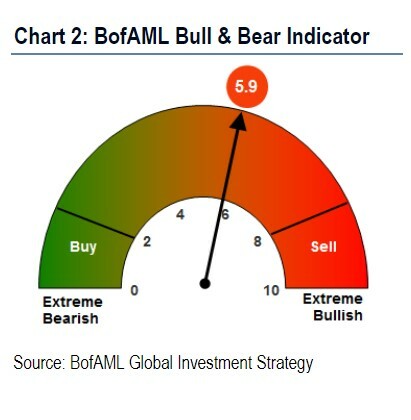 The Bull/Bear indicator, at 5.9, is still in bullish territory, although not as bullish as on previous occasions. It could be that investors are aware of the fact that central banks need to start winding down their extraordinary monetary policy, but many of them are careful not to upset the markets too much. Markets are trying to price this in by attempting various combinations of assets. We’ll probably see more of this “schizophrenia” in the future.